How to Make Moose Box #piday #raspberrypi #iLuvPi2 @Raspberry_Pi « Adafruit Industries – Makers, hackers, artists, designers and engineers! 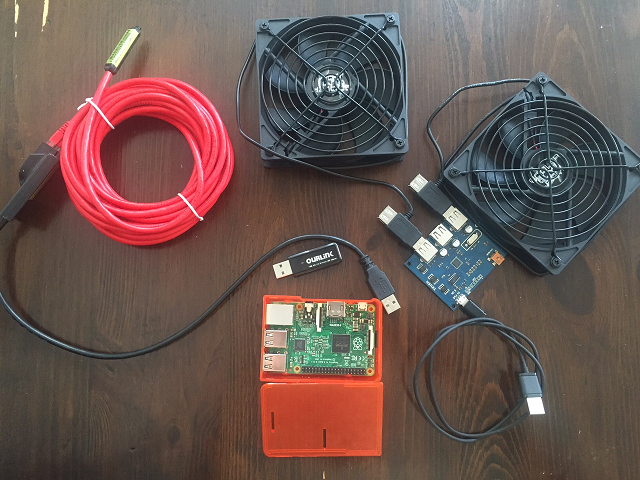 MooseBox is a Raspberry PI 2 based platform for regulating cold air using programmable fans and temperature sensors. The end result is to put pure science behind the process of making homemade soppressata and wine. It is a joint project between myself (Chris Cavage) and my father (Joseph Cavage). I am writing all of the software and administrating the Raspberry PI 2 setup while my father is going to do the measurements, wood-working and duct-work for bringing in cold air during the winter months at our Northeast Pennsylvania homestead. Independent automation of N programmable fans based on temperature. Support for 1…M Temperature Sensors. K subscribers to M Temperature Sensors for email notifications for Temperature Alarms based on an end-user’s chosen min/max thresholds. Accumulation of time-series data for each sensor; aiming to store upwards to 4 months of data for each temperature sensor. Provide an iPhone client application with the ability to plot live and historical data, configure temperature alarms, and monitor the power state of fans.